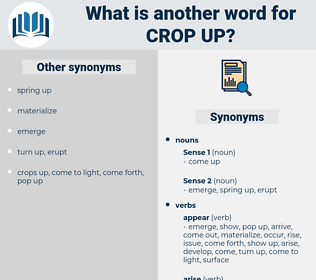 What is another word for crop up? leave, abandon, depart, go, hide, be real, disappear, conceal, miss. lay, end, cause, sit, complete, stop, finish, lie. go away, decrease, fall, trickle, fade, drop, lessen. halt, cease, lose, precede, fail. comply, give in, go along, decline, lower, cooperate, recede, regress, slump, descend. 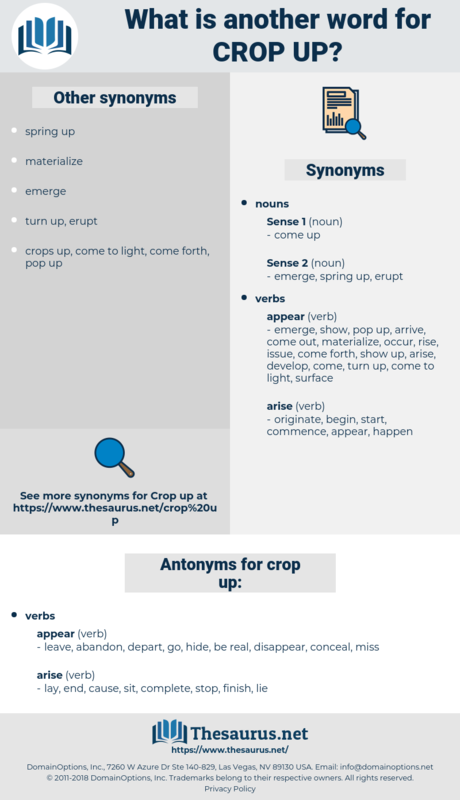 chirpy, carrier wave, cacography, crappie, crop, croup, creep up, carve up, creep, crap up, corvee, cecropia, choirboy, chirrup, corypha, crave, crib, curvy, carry off, curb, cherub, crp, croupe, corp, caribou, carve, cash crop, cryophobia, carp, coereba, curfew, carob, carhop, cheer up, curvey, crybaby, cassareep, carafe, crape, cowherb, carboy, carabao, curve, crab, creepy, carib, croupy, caribe, crabby, coscoroba, crepe, chirp.